Alex shares five alternative resolutions, with all the advantages of a juice diet, for a healthier New Year. Let me start by saying that New Year’s resolutions make me absolutely giddy. January 1st brings joyful inspiration for all the best clichés of breaking old habits, wiping the slate clean, and getting a fresh start. Gym classes overflow, salad intake triples, office snacks turn from the holiday remnants of cookies and chocolate to apples and carrot sticks, and we all become the most disciplined versions of ourselves, albeit temporarily. My anti-resolution adversaries believe that the short-lived nature of New Year’s lifestyle changes is cause for ridicule. Why begin a health behavior that can’t be maintained? As a registered dietitian who generally promotes sustainable habit modification, I can understand the point. In part, it is this rationale that has helped me to discourage friends and clients from participating in extreme and restrictive diets, such as juice cleanses. 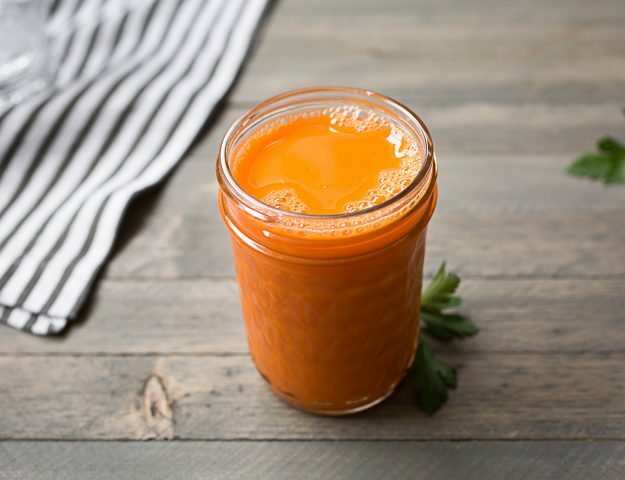 Proponents of juice fasts boast a “quick-fix” of detoxification, increased absorption of the vitamins, minerals, and phytochemicals found naturally in fruits and vegetables, weight loss, improved digestion, and clearer skin. Some of this hype has evidence to support its legitimacy. For instance, juicing certainly retains micronutrients, but it sacrifices the beneficial fiber of pulp and skin that aids digestion and helps us feel full. Additionally, even a short-term juice cleanse can lead to weight loss. Most all-juice diets contain around 1000 calories per day, which is only 45-55 percent of what the average American should consume for weight maintenance. While some of the weight loss experienced by juice-fasters is unwanted fat, extreme caloric restriction can also lead to the loss of muscle and water. Although “detoxification” is one of the most popular claims of the juicing community, the human body has it’s own detoxification system through the liver and kidneys. It’s important to have a healthy lifestyle to support these organs, but a juice diet is not necessary for maintenance. From my perspective, one of the greatest deterrents of a juice cleanse is its basic nutrient composition. Carbohydrates, and namely, sugars, are typically the most abundant nutrients in this style of diet, and protein and fat may be minimal or nonexistent. This nutrient distribution can lead to swings in mood and energy levels and does not promote optimal brain or muscular function. Despite the widely publicized critiques of juice fasts, every January 1st, hoards of eager resolutioners line up to partake. Why? My hunch is that the allure of this diet lies in both its extremity and its length. The notion of achieving perfect health for the sacrifice of only seven to ten days is incredibly tempting, even for those who know better. While habitual health behaviors are ideal, long-term resolutions can be intimidating and discouraging. Therefore, I propose that we harness the attraction of a juice diet: that it is temporary, that it encourages people to think about their health and try something new, that it is challenging and feels like a great accomplishment, and that it has guidelines and a supportive community. Here are five alternative resolutions, with all the advantages of a juice diet, for a healthier New Year. “Cleanse” yourself of sugar and alcohol. For a week to a month, experiment with a diet that contains no alcohol and/or no added sugars. These substances do not have nutritional value, yet we crave them, and they can become crutches in times of stress. Look into the Fed Up Challenge for guidelines and a sugar-free support system. This article and others around the web can offer some information and guidance for a “dry January”. Eat a whole foods diet. “Eat food, not too much, mostly plants.” Live the words of Michael Pollan by eating real foods – no packages, added chemicals, or ingredients you can’t identify or pronounce. To go a step further, try the Whole30 diet. Achieve a new fitness goal. Push your physical bounds by stepping out of your typical exercise routine. Try a new class or type of workout at least once per week. Move With can help you find unique and local activities. Start a meditation practice. The research supporting health benefits of meditation is considerable and expanding. Try the Headspace “Take 10” challenge for an excellent introduction to this practice. Eat mindfully. Take the time to eat meals with awareness and gratitude. Sit down at a table for your meals, and put away your computer, book, phone, and newspaper. Browse through the Center for Mindful Eating website to learn more. For any resolution, pick an amount of time that you feel is reasonable and accomplishable. Document before and after, as well as challenges and wins along the way. When you’ve completed your challenge, assess what you can incorporate into your daily routine. And lastly, don’t wait for January 1st to try something new. Happy resolutioning!